On June 14th, a concert was held in Japan in tribute to the late Grand Master Daihachi Oguchi. Many Taiko Masters and Taiko groups took part in this very special concert. 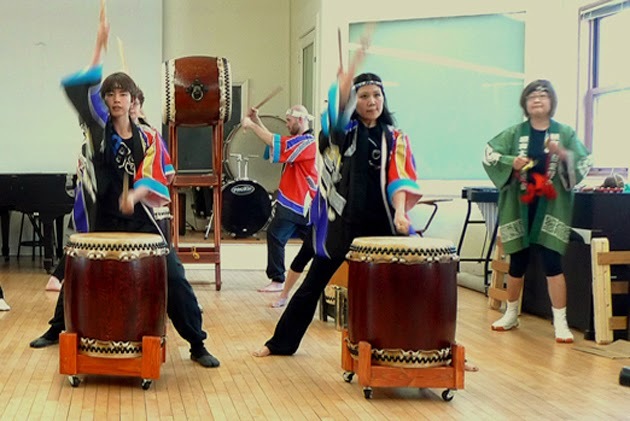 Here in New York, a concert gathering was organized by the New York Suwa Taiko Association (NYSTA) and held at Hiro-sensei's studio in Brooklyn on the same day. Many members of NYTAK participated in this event, and below are some photos taken that day. New York Taiko Aiko Kai is one of the Taiko groups in residence as part of the TC Taiko Society at Teachers College, Columbia University. It began in 2002 when a few families at an Upper West Side public school began practicing Taiko with a hope to pass Japanese culture to their children. The group has always been family oriented, but many adults have also joined the group over the years. Hiro Kurashima, Osuwa Daiko Shihan, who was certified by the late Grandmaster Daihachi Oguchi, was the founding teacher of the group, and continues to teach and perform with the group regularly. NYTAK has performed at various schools and institutions, including the Sakura Matsuri at the Brooklyn Botanical Garden, Japan Heritage Day at the Staten Island Yankees, and public and private schools in New York. We are currently not accepting new members but contact us if you are interested in hearing about our upcoming workshops and performances.